I don’t have much in common with my 12-year-old son any more. I don’t write Minecraft apps and he doesn’t embroider. My idea of fun is strolling through a lovely garden and his is slipping and sliding feet first down a water slide. That’s OK. We venture into each others’ worlds often enough, and luckily we both love the art of conversation. Today we found a precious piece of common ground. He is a civil war aficionado and I am a quilter. And Illinois State Museum in Lockport is bringing both of these interests together in a stunning display until Oct. 17. Please make the time to go visit. You won’t regret seeing these lovely pieces of history in person and reading the stories. This white on white embroidery whole cloth piece is just stunning. Ask the docent to run the light over it or behind it to get the full effect. Something that had me just mesmerized was the way the cloth does not pucker from all the stitches. I’m still not sure why. 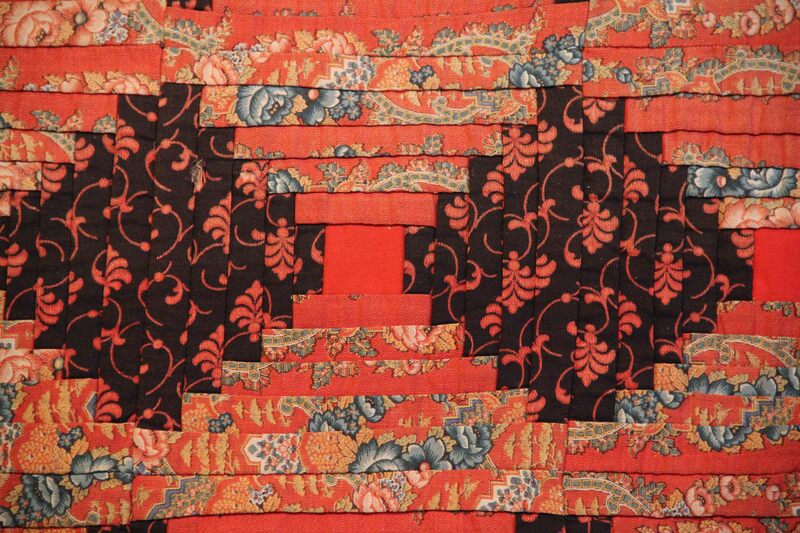 The thread is heavy and the stitching is dense and very elaborate. A mystery that went to the grave with this woman. This one was probably done 1912-1915. Hence the 48 stars. The women who assembled this would have been commemorating the local soldiers, and this likely was a raffle piece. Detailed hand embroidery for every name on the quilt. 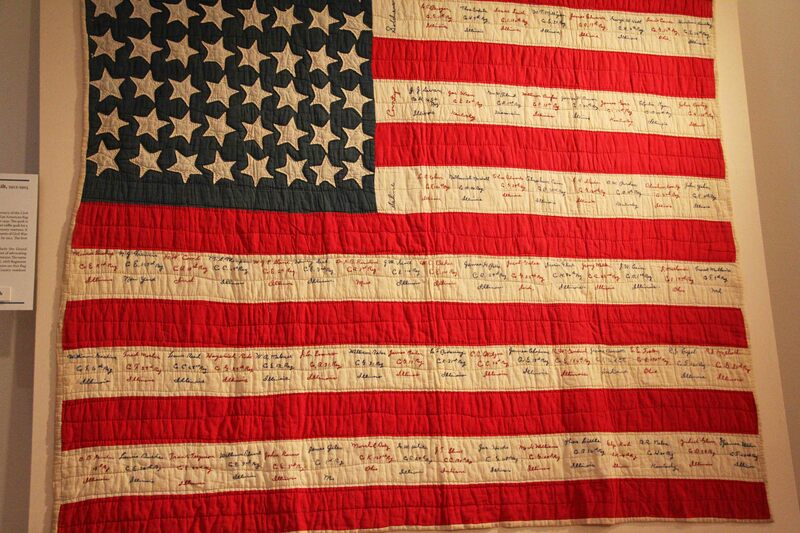 The young lady who created this quilt was from Aurora IL in Kane County. Her husband went off to the war and she stayed home with family and created this masterpiece. It is speculated that she had ties to the general store and had access to precious fabric. Cotton was not easily obtained so she used wool. 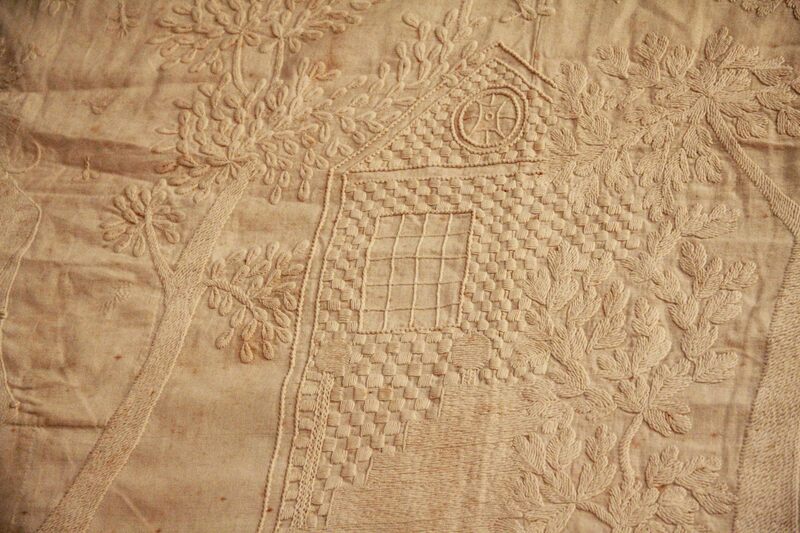 My favorite piece, which is obviously one of the stars of the show is this Log Cabin quilt. 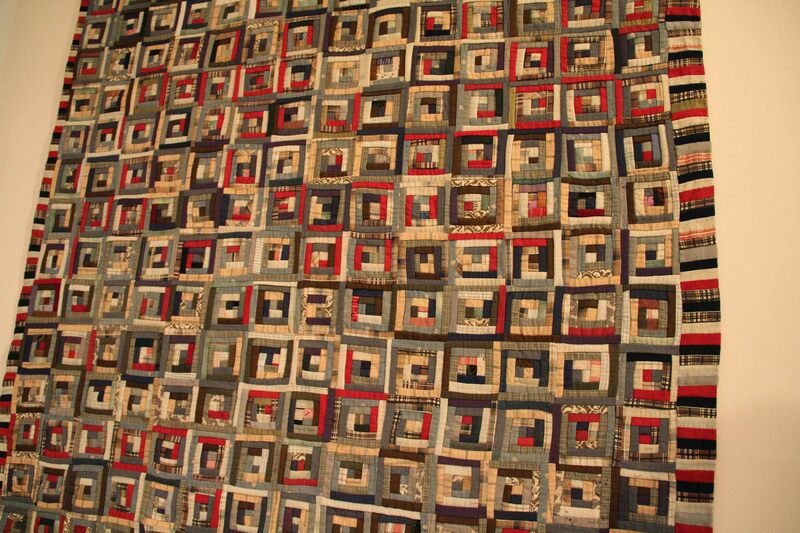 The story is that the woman who made this quilt had sons in both the Confederate and Union Armies. 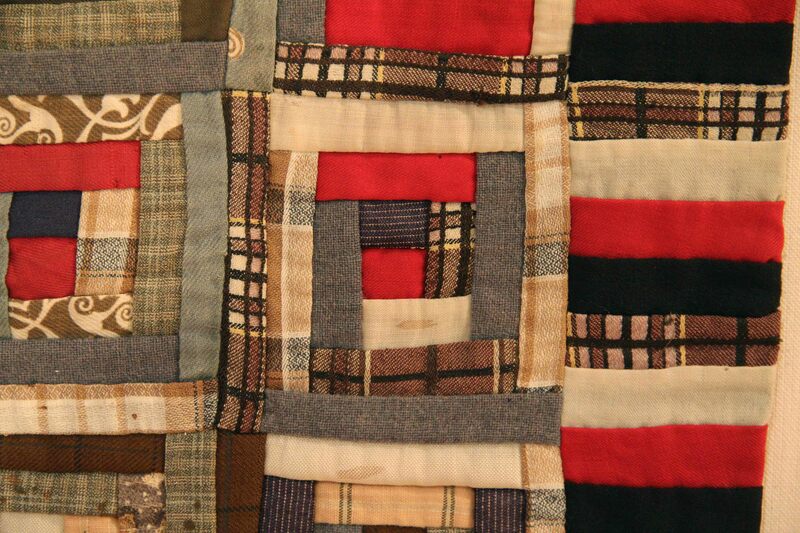 Pieces of uniforms from both sides are embedded in the quilt. I’m not sure why, but it never occurred to me that Illinois could lean both toward the North and toward the South. Chicago, of course was Yankee territory, but southern Illinois, down near the Kentucky border, was very much considered the south. 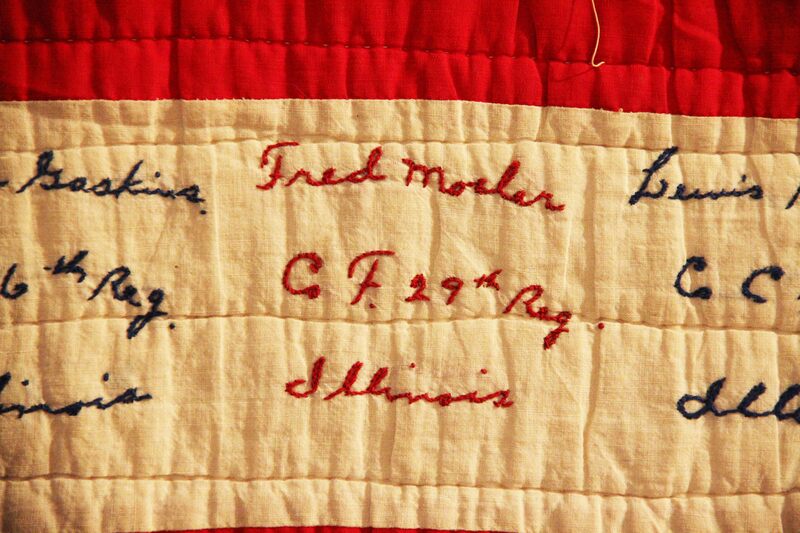 Precisely what makes this quilt so very “Illinois” and so very poignant. Finally, I had to include this gem. 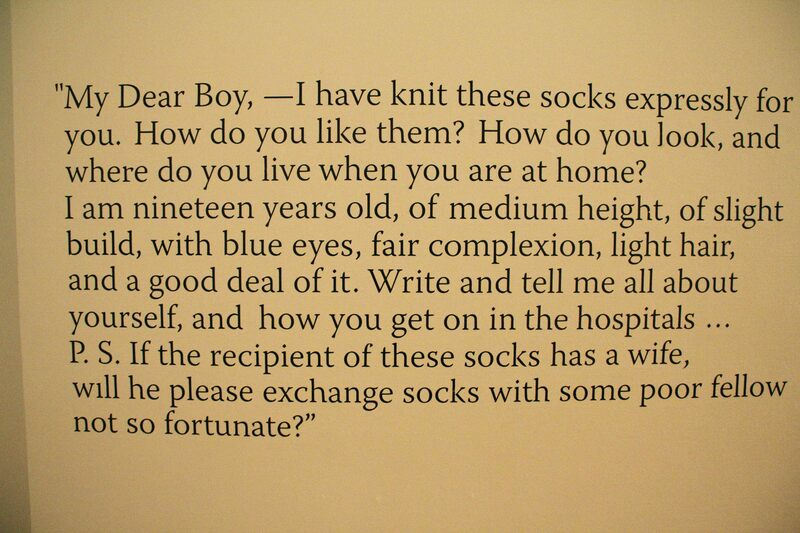 Taken from a note sent with a pair of socks, it is a civil-war era form of social media. Match.com-style. We gals haven’t changed so very much over the years, now, have we? 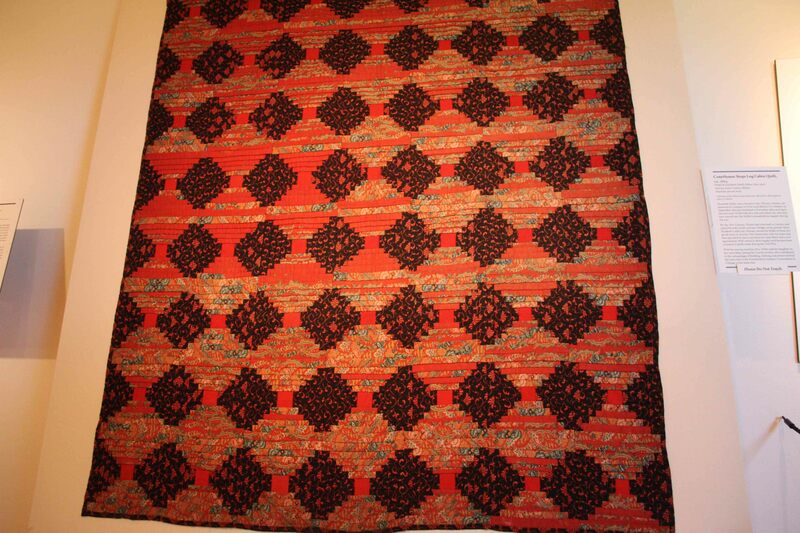 This entry was posted in Creativity, midwest and tagged civil war quilts, quilting, sewing by edges. Bookmark the permalink.